Dr. Fox was born and raised in Franklin, PA. He is the oldest of four siblings, all of whom enjoy hunting and fishing. In 1980 he graduated from Allegheny College in Meadville PA with a Chemistry Degree. In 1984 he graduated from Temple University in Philadelphia. After graduation he went on to do a one year residency in York, PA at York Hospital. 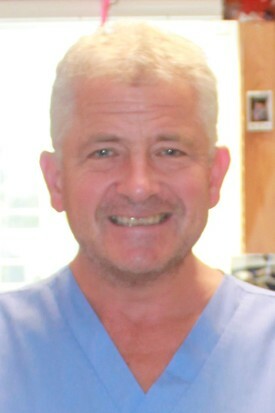 Dr. Fox currently resides in Conneaut Lake, where he opened his practice in 1986. Dr. Fox enjoys the outdoors, whether it be boating on Conneaut Lake, hunting local wildlife, or going on walks with his two English setters, Bella and Kady. He also has a great passion for buying and selling antiques, which he likes to display through out the office. Aside from dentistry, Dr. Fox is a Yoga instructor and has been teaching classes since 2000.